Birthday gifts for her. Are you looking for birthday gifts for her? It's always a challenge trying to choose the perfect gift that the special woman in your life will appreciate. But don't worry. There are many great gift ideas that are perfect no matter what kind of person she is. 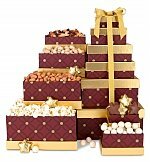 These range from spa baskets, candle and aromatherapy baskets, to wine or champagne baskets. Gift baskets make the perfect birthday gifts for women because they give you so much flexibility and are a gift that's really thoughtful. The great thing about gift baskets is that you can design them around a theme that suits her personality or her hobbies. You can find an idea for just about anything and present it in a beautiful package. For example, is she a wine connoisseur? Then design a gift basket that is filled with many different unique wines with accessories she'll use again and again. What if she loves the outdoors and enjoys picnics? Simple, just design a picnic gift basket filled with delicious spreads, tea, coffees, and desserts. What if her favorite pastime is reading a good book? You can design a basket with a great collection of books for her to indulge in. If there isn't anything that stands out, you can design a special romantic gift basket for the two of you. This is one of the best birthday gifts for her, as you can both enjoy a simple date. A great romantic theme can be one with a bouquet of roses, champagne, and some delicious sides that both of you can enjoy on your date. Birthday gift ideas for women - many gift choices for ladies. Garden Gift Basket - gifts for the gardener. 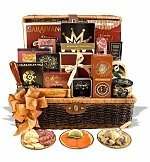 Spa Gift Baskets - gifts to relax by. Still stuck on what kind of gift basket to get? You can never go wrong with a gift basket for women's beauty. Almost every woman appreciates quality products that give her the spa experience in the very comfort of her home. Everything from aromatic candles, special soaps, skin care products, creams, and hair care products can be included in this basket. Keep in mind that you don't have to go with any particular theme. There are all kinds of different baskets that make the perfect birthday gifts for women. 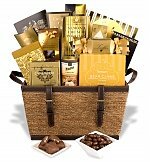 One basket that really stands out is a chocolate gift basket. Who can resist a delicious collection of various gourmet chocolates? 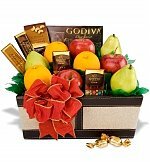 If the woman in your life is more health conscious then you can go with an exquisite fruit basket. The best way to pick a gift basket is to think about her particular likes and interests. Make a list of anything and everything that she would really enjoy. Then, make the list smaller into the few things that you think she'd like the most. From there, it's about going with a gift basket that fits your budget and fits the theme you are looking for. So if you're looking for birthday gifts for her, you can never go wrong with a gift basket. This is one of the best birthday gifts for women because you can custom tailor it to who she is. There are so many types of baskets you can get at all different prices. All you need to do is think about what she would enjoy best and you're on your way to selecting the perfect birthday gifts for her.